There is nothing more serene than watching a waterfall. People come from all over the world to watch water move and fall and drop and move on again. One such town that visitors love to flock to for it’s waterfalls is Milford, PA. The combination of the natural beauty of the countryside of PA and the rush of the majestic waterfalls can leave you speechless while visiting Milford. Locals as well as visitors love to spend our time outdoors when the weather is good. Any season can be waterfall season and each time you visit you will see something different. We at Ledges Hotel love recommending activities for our guests to do while they are staying with us. Here are our top 3 Milford, PA waterfalls. The first in our list of Milford, PA waterfalls is Buttermilk Falls. Buttermilk Falls is a 45 foot waterfall that is housed inside a 48 acre park. This waterfall is different from other waterfalls in how it is composed. Most waterfalls are made by a stream eating away at an easily erodible layer of rock and then underneath it, it faces a more resistant layer. This resistant layer then erodes at a slower rate which then forms the waterfall. Buttermilk Falls is different in that the resistant layer is sandstone and the erodible layer is shale. While visiting, the park is kept in its most natural state with only a few picnic tables. This is to ensure that visitors will enjoy the beauty of the area. Be sure to also enjoy the nearby trails and viewing areas. The George W. Childs Recreation site is our next recommendation for Milford, PA waterfalls. The main reason why is that there is so much to do here. There is a short trail that winds around this former park and through it you can see multiple waterfalls. The hike around the park is fairly easy and along the way you will be able to see a multitude of local species of flowers as well as hemlock groves. Be sure to bring a picnic and the family because everyone will have a great day at this park. 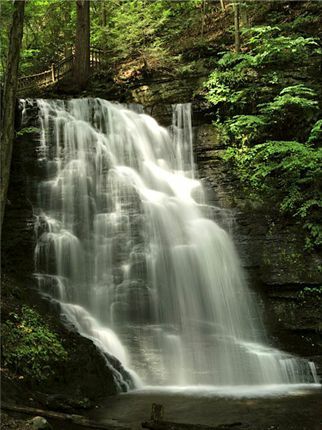 The last in our top 3 Milford, PA waterfalls is Bushkill Falls. This area is not to be missed. The entire park is about 300 acres and houses 8 waterfalls as well as about 2 miles of trails that will lead you to the most amazing views of each of the falls. Out of the 3, this is the only park that is privately owned so be sure to check their website for hours of operation. The admission is a steal at $12.50 for adults, $11.50 for ages 62+, $7 for ages 4-10 and under 4 are free. Besides admiring the falls and hiking the trails, the kids will have a ton of fun with their special children’s playground as well as mining maze and paddle boating and gem mining. As you can see, Milford, PA waterfalls attract a lot of visitors to our area. While they stay here, most love calling Ledges Hotel their home away from home. We love doing our part to help conserve and protect PA by opting to include environmentally friendly fixtures in our rooms and donating a portion of our reservations to helping conserve our fantastic state. Give our amazing staff a call today to book a room as well as help with recommendations for not only Milford, PA waterfalls but for other fun activities as well.